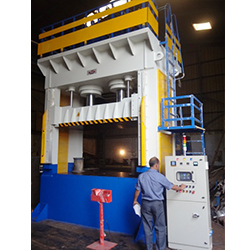 Santec manufacture wide range of machines for various industrial applications. 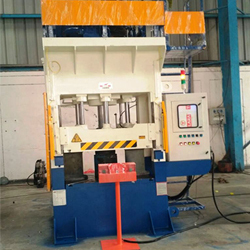 Now these high quality machines are readily available in Ready Stock hence now no need to wait for these machines for longer delivery schedule. These machines are ready for immediate shipments. Technical details are given in front of the pictures. If need any further details, please do not hesitate to contact us. Type Vertical Four� Columns� Type Structure, Frame is fabricated out of ultrasonically tested Steel Plates duly welded with suitable reinforcements to give strength & load during operation. No. Of Cylinders / Ram 1 no. main Cylinder + 2 nos. side Jacking Cylinders for� blank� holder�s� fast down &� fast� up movement + 6 nos. blank� holder� cylinders fixed� at� equal distance for uniform distribution of blank holder force or better clamping of sheet + 1 no. ejector cylinder . Bore (piston) Dia. of Main Cyl. 11"
Operation PUSH BUTTON OPTD. WITH�ELECTRICAL�CONTROL PANEL. PLC Omron / Siemens make with coloured touch screen for user friendly operation. Qty. Available in Ready Stock :- 1 Nos. Type Fabricated 4 columns type Press with Down stroking ram movement. Capacity Of The Main Ram 150 Tons (1 no. main cylinder + 2 Nos. double acting type jacking cylinders for fast approach, & fast return speed . Moving Platen guides Phosphorous Bronze liners / bushes Specially designed at four corners of the slide with Lubrication Arrangement. Piston Size (Bore Size) Main Rams 310 mm - Approx. Fast Approach Speed 60 � 70 mm/sec. Pressing Speed 6 to 8 mm/sec. Slow Mold Opening Speed 0 - 20 mm/sec. Fast Return Speed 70 - 80 mm/sec. Upward Speed 0 - 40 mm/sec. Downward Speed 0 - 50 mm/sec. Bottom Plate Ejection Hole 50 mm. PLC Omron / Siemens make PLC with touch screen display (MMI) for User -friendly operation. Type Four Nos. 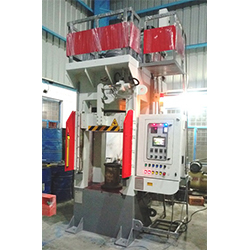 Heavy duty Fabricated Columns type Press with Down stroking ram movement. Capacity Of The Main Ram 250 Tons (1 no. main cylinder + 2 Nos. double acting type Jacking cylinders for fast approach & fast return speed. Moving Platen guides Phosphorous Bronze liners Specially designed GIB Guiding Arrangement at four corners of the slide with Lubrication Arrangement. Slow Mold Opening Speed 15 � 20 mm/sec. Fast Return Speed 160 mm/sec. Type Two Nos. 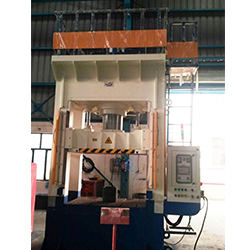 Heavy duty Fabricated Columns type Press with Down stroking ram movement. Capacity Of The Main Ram 600 Tons (2 nos. main cylinders + 2 nos. double acting type Jacking cylinders for fast approach & fast return speed. Piston Size (Bore Size) Main Rams 390 mm (each) - 2nos. Fast Approach Speed 150 - 200 mm/sec. Fast Return Speed 160 - 210 mm/sec. PLC Omron / Siemens make PLC with touch screen display (MMI) for User � friendly operation. Type 2�Nos. Fabricated�column type�(Downstroking�Ram�Movement) with Hydraulic Locking type tie rods. 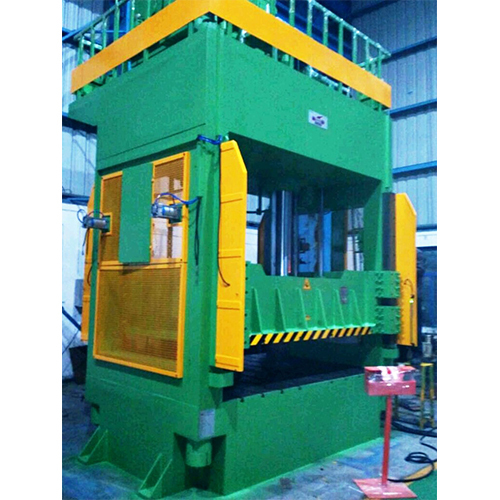 Return Capacity 20 x 2 = 40 tons (return cylinder mechnisam must be single acting only for pull back forcing. Main Cylinder 2 nos.� main cylinders double� acting� type� with 2 nos. Side cylinders - double acting type. Heated platen Size 2400 mm (L to R) x 1800 mm (F to B) (Thickness of bottom table 90 mm / Top plate 80 mm) with through T - slots. Pump Double Pump for� High & Low pressure. Operation Double Pump for� High & Low pressure.